Help the environment. Secure your data. Order one of our recycling boxes with a pre-paid shipping label. Pack your old electronics into the box. Ship the box and we’ll handle the rest. Need help choosing the right box? Quill.com Technology Specialists can help—call 800.789.1331. 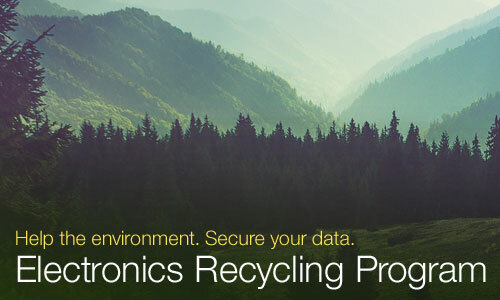 Misappropriated e-waste is one of the most common causes of data breaches. E-waste can contain lead, mercury, cadmium and other hazardous material, which can leach into the soil and groundwater if improperly recycled. Our Electronics Recycling Program is a partnership with Electronics Recycling International, Inc. (ERI)—the nation’s largest e-waste recycler. Devices are wiped 7-10 times in accordance with Dept. of Defense and National Institute of Standards and Technology protocol before being sent to a state-of-the-art e-waste shredder. ERI is the first electronic waste company to be dually certified by both R2 and e-Stewards standards. A strict zero-landfill, zero-export policy guarantees no piece of a device ends up in a landfill anywhere in the world.